Perfect for ANY Classroom in ANY Primary or Secondary School -- Here's how! MFSF was originally conceived to meet the curriculum requirements of Year 7 English in New South Wales, Australia. It meets some or all of the official curriculum requirements in every state in Australia, as well as in New Zealand, in the subject areas of English, Media Studies, and Drama. By using the short film making experience as a LEARNING tool, you'll cement key course lessons in their memories forever. Students in a history class could make short films re-enacting historical events they're studying, or the lives of historical figures. Students in a science class could make short films with students playing "atoms and molecules" to show how they interact. Students in a geography class could make short films about how various natural wonders were formed. Students in foreign language classes could make short films about virtually anything, using only the foreign language being studied. Students in a health class could create short films about how to improve health, or how to get a friend to avoid smoking. 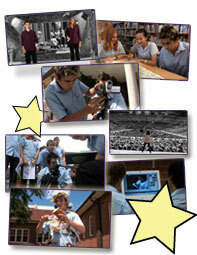 Students in any class could make short films about the lives of students at the school itself. The teacher can simply require students to include key facts, figures, or lesson materials in their short films. Making Fantastic Short Films is a revolutionary tool for the classroom, and one no school should be without. Give your students the greatest learning experience they've ever had. Order your copy today!